What do the cards tell us? Music hall and pantomime postcards were sent for reasons from the elevated to the mundane, to increase a collection of photos of a favourite artiste or to tell a friend there was tripe for dinner. In 1907 Ethel apologises for not sending the Florrie Forde postcard that Amy really wanted and sends Florrie in a greatcoat instead. We don’t know if Amy ever found the desired card but we have it here – Florrie Forde in Dutch costume. Happy Fanny Fields was an American who performed in Dutch costume with clog dancing being an important part of her act. The sender of the card adopts a humorous tone explaining that ‘sa‘ cannot write as she is busy making bloomers. The writer is pleased to have finished the washing and got Frank’s stockings darned with a chips and fish supper to look forward to, followed by ice-cream and (hard to read, so possibly not) tripe. The next day there will be liver and onions and savoury pudding for dinner. Ella Grahame sends a card from Warsaw featuring herself and Rosey Anslow in their roller-skating act. She asks if the recipient likes her in pants – ‘ what price this for swank’ – and says that the people there can’t get past the size of her bottom. Hetty King, the male impersonator and pantomime star features on two cards sent by the same person, who identifies himself using only initials. In 1907 he writes to Mrs Baldwin to say that he is still surviving but mother ‘has got them again.’ The same recipient learns that the sender got two valentines ‘one a rotten the other a nice tie.’ He also had a fine lecture off ma. Marguerite Broadfoote tells us modestly that ‘there is a much better picture of myself on the postcards – a profile head. This one is not considered a good likeness.’ Vanity, vanity. 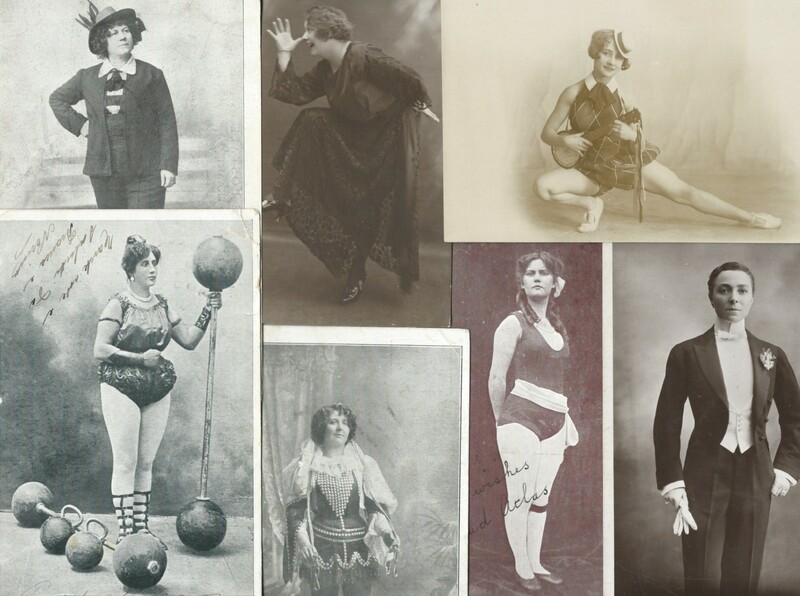 This entry was posted in Male impersonators, Music hall artistes, Music hall postcards, Pantomime, Pantomime postcards and tagged Anslow & Grahame, Florrie Forde, Happy Fanny Fields, Hetty King, male impersonator, Marguerite Broadfoote, Pantomime on March 5, 2017 by Monomania.